Former boxing world champion Amir Khan is setting his sights on a possible showdown with Ultimate Fighting Championship superstar Conor "The Notorious" McGregor or a rematch with current World Boxing Council welterweight champion Danny Garcia. According to BoxingScene, Khan made the challenge to McGregor during his visit to UFC Gym in Downtown Dubai. "I'll go and fight Conor McGregor just to prove I'm a real man. I'm not one to back away, I've never backed away from any fight and I never will," said Khan, who is no stranger to mixed martial arts. The British boxing superstar is a promoter of another mixed martial arts organization and has trained with UFC legends Georges St-Pierre and Andrei Arlovski. Khan believes he will only need one year of training to get ready for the current UFC featherweight champion. Aside from a showdown with McGregor, Khan is also eyeing a potential rematch with Garcia, his former conqueror. Khan suffered a devastating loss to Garcia during their previous encounter despite being the heavy favorite going in to their title unification match in 2012. Timing seems to be the only snag on the encounter with Garcia, as the welterweight champion is scheduled to be back on September 24, which is too soon for Khan. Khan underwent surgery to correct an issue with his right hand. "I've had this hand problem since my second fight when I broke my hand fighting a guy called Baz Carey. Since then it has never been the same," Khan told Sport360. "The doctor told me that the ligaments were destroyed so, after seven years, I finally got it operated on. I was told I have only been fighting with 30 percent power." 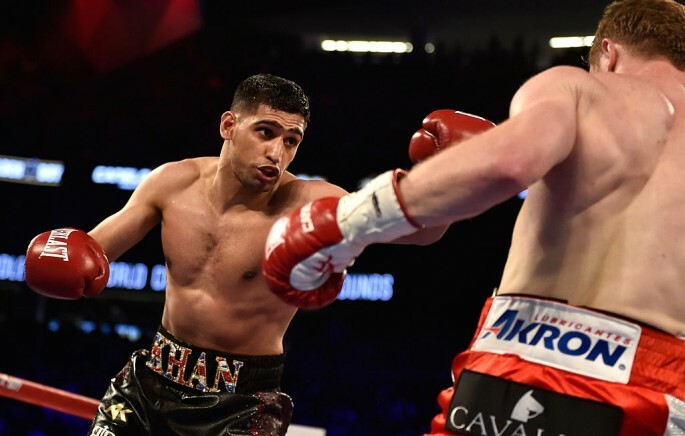 Khan has been lobbying for a big-money fight despite taking a devastating loss in his most recent bout. The 29-year-old opted to move up to the 154 pounds in his last fight but took a humiliating sixth-round knockout loss to Mexican boxing superstar Saul "Canelo" Alvarez. Khan owns a mandatory shot at Garcia. The Philadelphia native, who owns a perfect 32-0 record, won the vacant WBC welterweight title via a unanimous decision win over Robert Guerrero in January. Watch Amir Khan's career highlights below. Manny Pacquiao next fight: 'Pacman' ducking Terence Crawford?